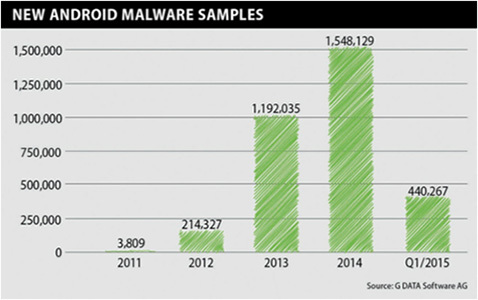 Every 18 seconds a new mobile Android malware is discovered in the wild as reported in the G DATA Malware Report Mobile for Q1 2015. 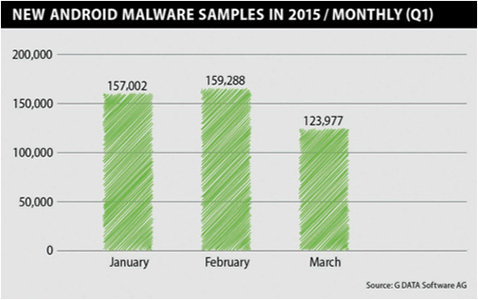 Security firm GDATA has published a report on mobile malware detected in the first quarter of 2015. The researchers discovered 440,267 new strains of Android malware, a new malware strain for the Android platform is detected every 18 seconds. The experts noticed a surge in the number of mobile banking especially malicious codes targeting the Android OS. At least 50 percent of the malware in the wild were designed to realize financial frauds, most popular are banking Trojans and SMS Trojans. The rapid increase in Android malware highlight the necessity to adopt defensive security solutions on mobile platforms, experts suggest keeping default security settings enabled, such as blocking installation from sources third-party App stores. In many cases, mobile users are deceived by social engineering tricks, in this way malware authors induce victims to turn off security settings. 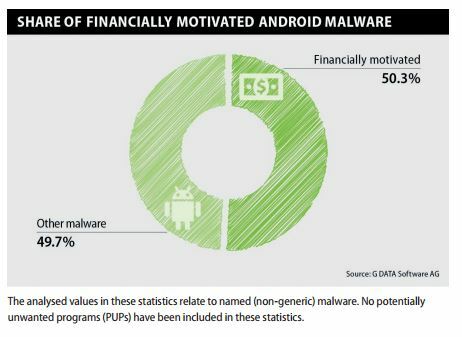 The data on the diffusion of mobile malware are not surprising, they are a direct consequence of the massive spread of Android devices and the increasing attitude of mobile users to access banking, payment and online shopping services from their Smartphone and tablets. 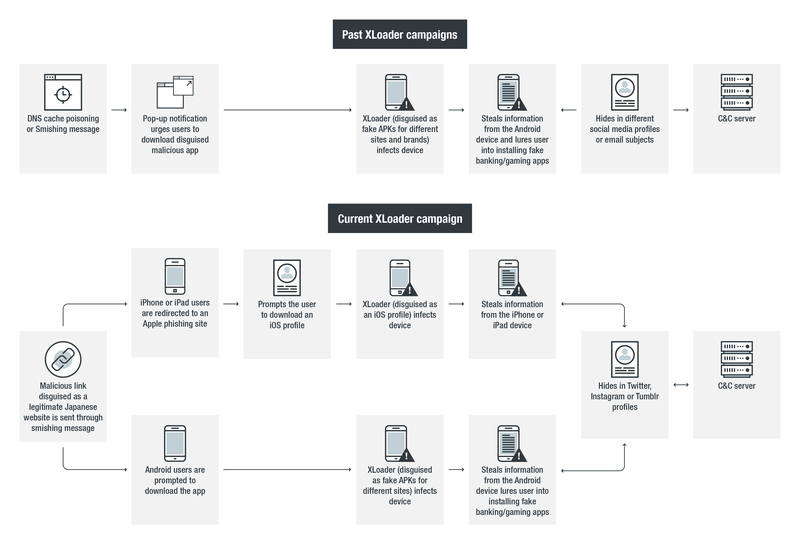 Another element to consider is the lack of a proper security posture of mobile users, disseminating mobile malware is a relatively easy job, as explained by Catalin Cosoi, Chief Security Strategist at Bitdefender. “As expected, cyber criminals prefer campaigns that make as many victims as possible with one hit. Disseminating mobile malware is also a relatively easy job. Attackers found ways to hide malicious code in repackaged apps sold on unregulated third party app stores,” Cosoi concluded. Enjoy the G Data Report.